Hall of the Mountain King: Review: Blood Tsunami - "Thrash Metal"
Name your record Thrash Metal and you’ve got my attention. Of course, you’d better deliver what you promise, too. Blood Tsunami does. The band is firmly entrenched in the worlds of 1980s German thrash and the San Francisco Bay area style, which of course, produced thrash’s biggest names. So what you’ll hear here is tight, blazing drums from former Emperor drummer Faust and fast technical guitar work from frontman Pete Evil and rhythm guitarist Dor Amazon. OK, so their stage names could use some work, but it’s the musicianship we’re talking about here, and that’s not in question. Blood Tsunami can rip out aggressive, almost melodic death metal blasts as on the opening track “Evil Unleashed,” and undeniable grooves as on the Exodus-influenced “Devoured by Flames.” Sometimes they do it in the same song – check out “Rampage of Revenge,” which is probably the strongest track on the record with one foot in each world. “Infernal Final Carnage” opens with a riff that could have been pulled straight from Metallica’s “Kill ’Em All,” but the band throws a curve when Evil unleashes a black metal rasp for the vocals. And that’s the real departure from the classic thrash sound. Pete Evil is screeching and rasping and occasionally bassist Bosse throws out a deep death metal rumble which serves as a nice counterpoint and adds that little needed punch in the gut to several of the songs. Like most of the thrash bands of the 1980s, Blood Tsunami has to offer up the epic 10-minute number. For this record, it’s “Godbeater,” which clocks in at 10:01. It’s a surprisingly strong performance, as the band backs off on the throttle a little bit and goes for a chugging, heavier riff to open the song. 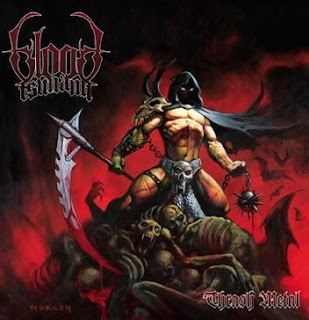 The black metal influence comes through again on the atmospheric parts of the song, and you’ll even catch a stray death metal touch here and there. But this is true classic thrash, reminiscent of Metallica’s “Orion” (right down to a wah-wah-laden solo straight from the Kirk Hammett songbook), and probably the best instrumental thrash piece that I’ve heard since Metallica quit doing them. True, there’s nothing really original or groundbreaking here. It’s more of an homage to a bygone era, but it’s a goddamned good one. It does an old thrasher’s heart good to hear the music played like this again. Long live thrash and long live Blood Tsunami.